So it's been raining all week here which has been just delightful. I am sure all the parents out there agree with me when I say that you rely on some outdoor time when you have kids so all this rain has been a bummer in terms of our day routine! 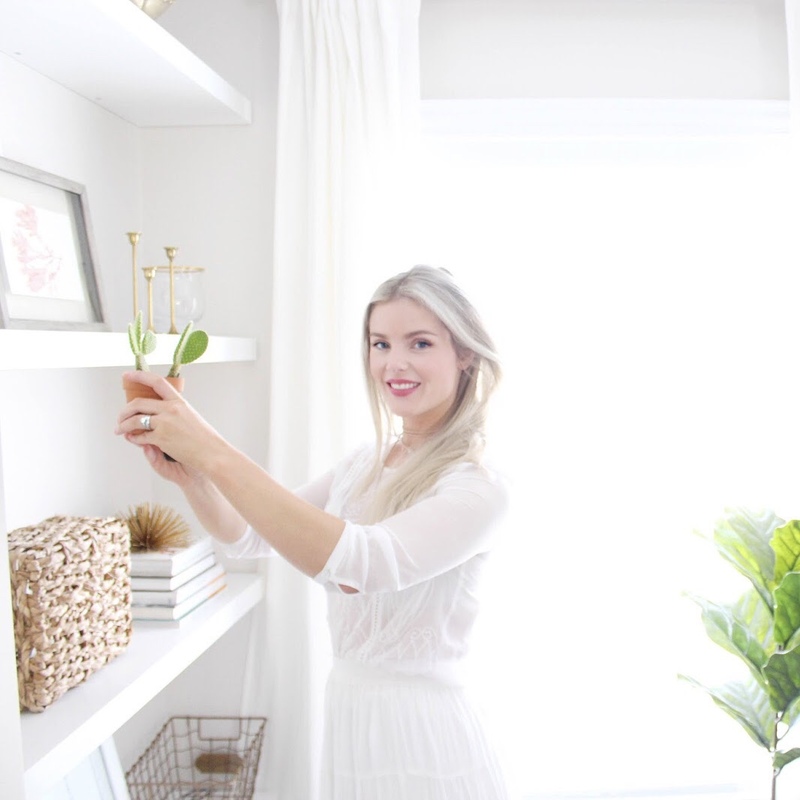 Since I'm dreaming of some time outside I thought today I would share my 5 must haves for your patio/deck this summer to really maximize that outdoor living space. 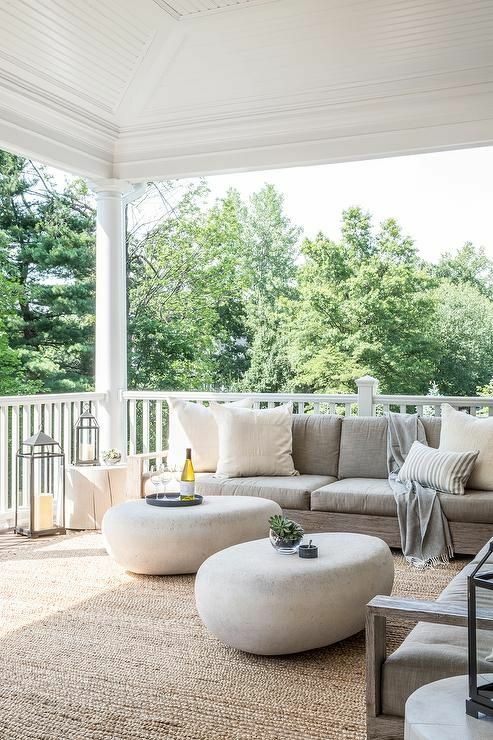 I feel like it's always nice to expand your living area to your outside deck or patio because you can really make it an extension of your home design wise and it's always nice to get out for some fresh air. 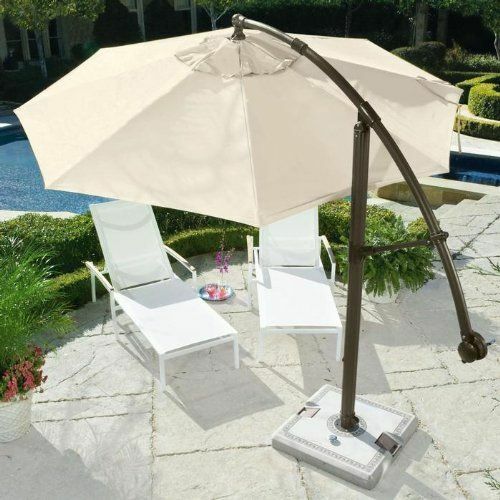 The first thing I think a deck must have is an arching umbrella. These are such a great piece to have outside because unlike the umbrella in dining sets you can move it around your space and it gives you a lot more flexibility. It's so important to have sun protection when outside so that those harmful rays don't reach your skin. Plus they are perfect with kids because you can move them around to where ever the sun is to give them as much shade as possible when playing. This is probably my favourite thing to have on a deck because it adds so much design wise and they are so practical. It's cozy on the feet, really sections off your space and it makes its feel more like your indoor living room. Plus if you have kids its perfect for them to play on and helps eliminate splinters and all that jazz that comes with a raw wood floor. I recommend going as large as you can because the same principles apply to your rug outside as they do inside- bigger is better. You guys know I couldn't talk about an outdoor space without including throw pillows. 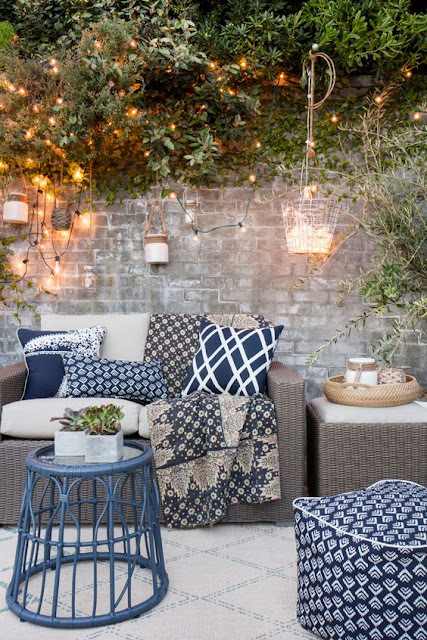 These add so much to your outdoor design area and are a great way to bring in some fun pattern and really cozy things up. Whether you have lounge furniture or a dining set, pillows look great on both and there are so many great ones out right now- definitely a must have. This may seem like a no brainer but it's easy to forget to add some pretty planters to your little backyard oasis. Now ima be real here, I have definitely incorporated a few faux plants to our deck so that I don't have to worry about the upkeep or them getting to much or not enough sunlight. I feel like there is no shame in having some faux plants on your deck because they have the same effect and again when you have toddlers that are determined to rip the heads of your florals, faux can be a good option. 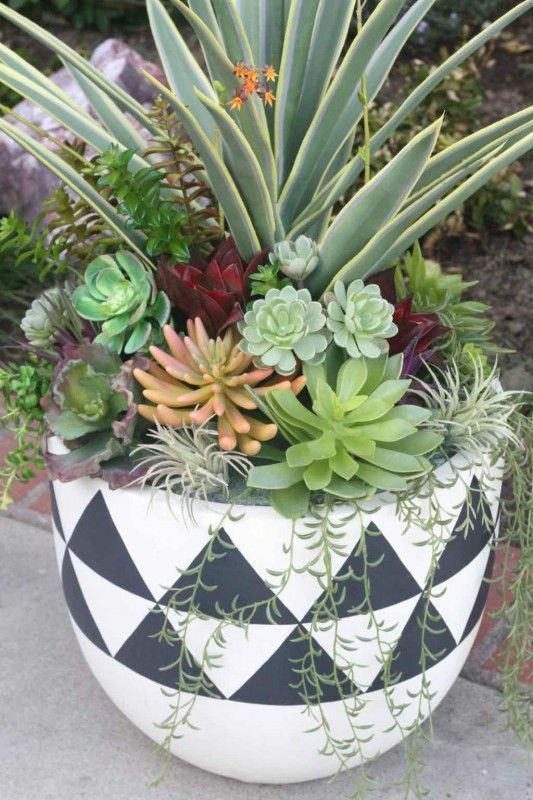 The succulent planter pictured above is gorgeous and believe it or not, it's all faux. Score. Lighting is such a lovely touch to your outdoor space. 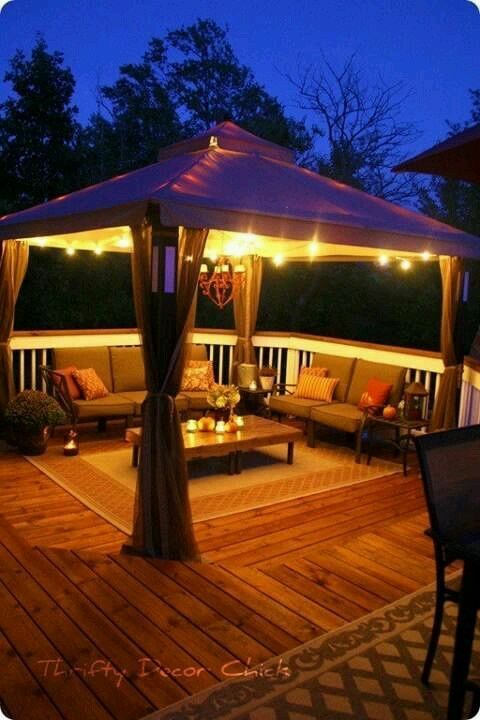 I love the look of the string bulb lights, they are so pretty at night draped across your deck. Also solar powered lanterns or battery powered candles add ambience along with ceramic potted fire pits. I feel like having some pretty lighting outside really encourages you to use the space at night. After all what's more relaxing after the kids are asleep then pouring a glass of wine and enjoying your little backyard oasis. I am telling you right now I've been on the hunt for the perfect outdoor throw pillows all months long and by the time I come across them I'm sure it will be Christmas!! I don't know why I'm having such a hard time! I hit up all the winners locos, I must have missed the good ones! You should check the canvas collection at Canadian tire they still had lots of pretty ones when I was there the other day! And Bouclair has good ones too! Front and Back Patios paved structure are the best place to sit, relax and enjoy during warm as well as rainy days. Beautifully decorated with natural vegetation, furniture and lighting adds more charm to its beauty. So while it's true that the people make an event (and the people definitely made any event!) this space definitely adds a different dimension to it. Went to venue NYC here for an evening event and I was really impressed.